WHENEVER THE CONFLICT BETWEEN THE ancient Greeks and Persians comes under discussion, almost invariably it is the Persians who are thought of as the aggressor—the villain of the piece who get their comeuppance at the hand of a nobler foe—the triumph of a small nation winning an unlikely victory against overwhelming odds. Most of us are Eurocentric in outlook, siding with the fledging European nation that provided us our first democracy. In addition, our view of history is often coloured by the attitudes, biases and prejudices of our sources. So is our view of the Persian Empire unreasonably influenced by viewpoints antagonistic to their rule? Darius I reigned over the Persian Empire at its zenith, from 522–486 BC as part of the Achaemenid Dynasty, founded by Cyrus II a few years before Darius’s ascension. His was a reign that showed its ability to build a great, civilized society, both materially and administratively, which exhibited benevolence toward the peoples under its dominion. It should be observed, therefore, that however much the Greek historian Herodotus provides invaluable information about those times, he was disparaging of not only Darius’s accomplishments but also his vision of society. As a consequence, Herodotus betrays his prejudices and those of his countrymen toward the leader of the greatest empire the earth had ever known. Perhaps it was that Herodotus saw the defeat of the Persians at Marathon as justification for his views. After all, the Athenians accomplished an astounding victory: Greek determination, tactics and technology won over Persian arrogance, presumption and ill-preparedness. And that victory has coloured the view of Darius the Great since that time. Were the Greco-Persian wars inevitable? Perhaps. The encroachment of the Persian Empire upon Greek territories preordained an eventual clash of cultures–and heightened the potential for a clash of arms. Darius’s kingdom, at its height, extended in the northwest from Constantinople to the Aral Sea, and then across to the Indus River in the East. In the South, it bordered the Arabian Sea and Persian Gulf, extending down the coast of the Mediterranean through Lebanon and Israel to the Nile, encompassing Lower Egypt and across into Libya. The fact remains, however, that the Greco-Persian wars began primarily from causes innocent enough in themselves, stemming from cultural differences that caused inevitable misunderstandings. At the outset it was the Athenians who initiated the political outreach toward the Persians; however, in the end they created a problem that would resonate through the following years: an act that represented staggering diplomatic ineptitude. The Athenian outreach to the Persians stemmed from their insecurities regarding Spartan intentions. The Spartans had already once invaded Athens and although they had been repelled, the Athenians felt far from secure: both city-states existed together in an attitude of mutual distrust and hostility. Even if another military campaign against Athens was unlikely, they had reason to fear Spartan attempts to destabilise the democratic reforms developing within Athenian territories. A prime concern was that the Spartans would throw their support behind a faction within Athens that championed oligarchy rather than civil democracy. It was because of this insecurity that Athens made a ham-fisted attempt to secure support from its powerful neighbour across the Aegean. It was a pact, they believed, which would stay Sparta’s hand. Persia had already had experience with Sparta, even if they were not well-informed about the city-state of Athens. When the Persians annexed the Ionian territories under Cyrus, the Spartans viewed this as a threat. And they were right to do so, for in 514 BC, Persian forces had conquered Thrace and Macedonia, bringing them uncomfortably close to the major Greek territories. The Spartans therefore conveyed a message warning against any Persian designs on the Greek homelands. The Persian experience of Athens was soon coming. In 508 BC emissaries from Athens travelled to Sardis, the Persian headquarters in Anatolia. There they met Darius’s representative and the local governor. They carried a more conciliatory message. What they sought was an alliance where the might of Persia would serve to protect them from Spartan machinations. There was almost a comic element to the encounter: so inconsequential were the Athenians to the Persian mind that the Persian governor had never heard of them! Nevertheless, Persia entered into a treaty with Athens. Yet despite this moment of realpolitik, the Athenians committed the blunder of assuming that their agreement with Persia would see them as equal partners with the great empire. At the end of the negotiations, protocol dictated the Athenians offer tokens of earth and water to their hosts. Unwittingly, when they offered these symbols they were in effect offering fealty and acknowledging the superiority of their Persian partner. Even when they realised their error, the Athenian diplomats were unwilling to backtrack: the agreement was too important for their political, if not physical, survival as a city-state. This, however, wasn’t the case when the ambassadors returned home. The Athenian Assembly was outraged that their diplomats had, in effect, acknowledged their submission to Persia. Yet the Assembly then compounded their ambassadors’ error, unilaterally dissolving the pact without bothering to inform Persia. It was a serious underestimation of the significance Darius placed upon symbolic acts in their service of a cohesive empire. The actual outbreak of hostilities between Athens and Persia stemmed from a civil revolt on the west coast of Anatolia in 499 BC. The Greek city-states on Ionia had been under Persian control since 546 BC, now, after half a century, the Ionian city-states rebelled against the Greek tyrants installed by their Persian overlords. A leader of the revolt travelled to the Greek mainland to secure military aid for their struggle. While Sparta turned down the request for logistical reasons, the Athenians voted to grant aid: Athens joined with the city-state of Eretria in sending a military force to Ionia. The campaign took the Athenian forces to Sardis, the city where the pact between Athens and Persia had been sealed almost a decade earlier (and which as far as the Persians were concerned, was still in effect). The rebels, encouraged by the support they received, put the city to the torch, including a revered religious sanctuary. However, in the face of renewed onslaughts from the Persian forces, the Athenians and Eretrians retreated to their respective home territories. The remaining Ionian force crumbled and five years on the revolt was effectively quelled. 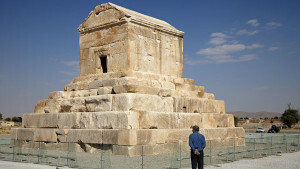 In the wake of the revolt and the restitution of Persian control, one might expect the Persians would have tightened their grip, installing even more repressive measures. Rather, Darius showed not only his beneficence but also his astuteness and pragmatism: he reorganized the governance of the territory, installing democratic governments to replace the tyrannical rule that led to the revolt. It was almost as if Darius was making a tacit admission that there had been grounds for the uprising—and so provided a conciliatory solution. Herodotus’ observation that Darius was best suited to be a tradesman or shopkeeper appears wide of the mark, an attempt to denigrate Darius. The fact is, Darius had already exhibited the hallmarks of a great leader. 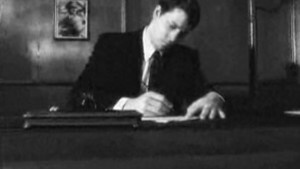 By delegating authority, allowing relative autonomy, as well as ensuring these satrapies exhibited a uniform mode of governance, he demonstrated a grasp of political and administrative realities. He was building an infrastructure able to sustain a large and diverse population. More than any previous ruler, Darius understood the importance of communication in holding together a vast empire. He built roads and opened sea lanes to facilitate trade, the functioning of his bureaucracy and deployment of his armies; he worked on the construction of a canal between the Red Sea and Nile River; he conducted building work at Susa, his administrative capital; and at Persepolis constructed a magnificent complex intended as both showpiece and political hub—a geographic centre-point to unite the empire. In addition, an important Royal Road from Susa to Sardis is first mentioned during Darius’s reign. Darius issued his proclamations in three languages—Old Persian, Elamite and Babylonian—to facilitate communication. At Persepolis, a place resplendent with stone reliefs of tribunes offering homage, actual tribunes from throughout the empire attended the Persian New Year’s celebrations. These ambassadors, from more than twenty different ethnic groups, appeared resplendent in their traditional dress and offered token tributes to their king. And they did so without coercion. There they witnessed the splendour and might of the Persian court: it was a coming together, an opportunity to pay homage and join the festive celebration. And a chance, upon returning to their home territories, to regale audiences with stories of the grandeur of it all and the magnanimity they had experienced. Darius commissioned monumental stone reliefs at strategic sites, which advertised his accomplishments. 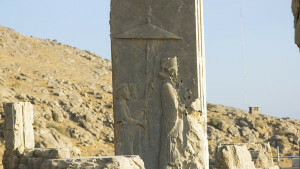 At Bisitun, east of Kermanshah, on the Great Khorasan Road, a stone relief was carved to commemorate the victory that saw his ascension to the throne. 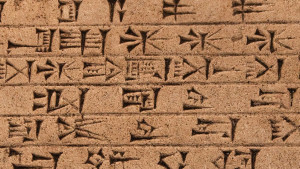 Inscriptions also were engraved proclaiming how Darius defeated his enemies and seized the crown. He was the first ruler in history to mint coinage that depicted his own image. It was a brilliant stroke; not only did it make commerce easier, as well as the payment of tribute, it also served as a means of effective propaganda. Even in a far-flung territory, a gold or silver coin of the realm served as a reminder of fealty to King Darius. His image was struck as a warrior with a drawn bow and quiver or spear emphasising both their submission to a powerful leader and the wealth his rule had brought. Darius was no shopkeeper. However, if Darius’s democratic reforms in Ionia were enlightened, his reaction to the Athenian support of the insurrection was a different matter. His sense of justice was outraged by what he deemed Athenian betrayal. The Athenians had provided tokens of their fealty just a few years earlier, now they had reneged. He found that unconscionable. One of Herodotus’s sources, the historian records, tells that while Darius was prepared to let the fate of the Ionians come in due course, upon hearing of the Athenian involvement, Darius “took [his bow], set an arrow on the string, shot it up into the air and cried: ‘Grant, O God, that I may punish the Athenians.’ Then he commanded one of his servants to repeat to him the words, ‘Master, remember the Athenians”, three times, whenever he sat down to dinner’ ” (Herodotus, The Histories 5.105). Nor had Darius any intention of forgetting the Athenians—the words that reminded of their treachery continued to be whispered into his ear. If that weren’t enough, a Greek by the name of Hippias, a tyrant of Athens before the democratic reforms, fled to the Persian court in Sardis when expelled and encouraged an attack on his erstwhile home. In due course, Darius responded to these influences, and in 492 BC despatched an invasion force to mainland Greece. However, wild storms destroyed much of the fleet and the surviving vessels turned back. The following year, Darius sent emissaries to various Greek city-states to demand their subservience by a demonstration of allegiance—with the ceremonial show involving earth and water. A large number refused, with some Greek cities even summarily executing the Persian diplomats. Such provocations demanded a strong response: Darius decided to deal with each in turn—once he’d settled the Athenian issue. What the situation did spark, however, was an unlikely agreement between Athens and Sparta to come to the other’s aid in the event of a Persian attack. Darius made good on his quest. He demanded trireme war ships, as well as transports for his cavalry, from towns along the Asian coast. In 490 BC, an armada of some 600 ships carried approximately 20,000 troops and cavalry to the island of Euboea where they attacked first the city of Karystos then Eretria. Their overwhelming superiority saw them victorious; they took captives and set the cities to the torch. Following the victory, the fleet sailed to Attica, making landfall adjacent to a plain near an insignificant village called Marathon. This landing-place was on the advice of the Greek traitor Hippias, using his local knowledge to brief the Persian commander, Datis. The site was well chosen. The adjacent battleground suited cavalry, while a lake nearby supplied drinking water. The next day, the Athenians began arriving, preparing to join battle. The Athenians had dispatched their best runner, Pheidippides, to carry the call to arms to Sparta. His epic run was one of some 240 km over several days, to request the Spartans join the Athenian forces at Marathon. The Spartans pledged their support but could not despatch a force until concluding their sacred Karneia festival. By the time they arrived, the battle had been fought and won. The only ally to fight for the Athenians was a small contingent from the city-state of Plataea, north of Athens. As the Persians joined the field of battle, it was clear they outnumbered the Athenian militia by more than two to one. It would almost have been better for the Greek forces had the invading Persian force been an unknown quantity; however, they knew more about the Persian strength than the Persians knew of the Athenian vulnerabilities. The outlandish uniform of the Persian force added to the psychological impact. Soldiers were covered head to foot, cloaked in a hood and clad in tunics and patterned trousers. The Athenian hoplites (heavy infantry), on the other hand, were covered in armour which was comprised of bronze, covering chest and abdomen, bronze greaves protected their legs from knee to ankle, and a bronze helmet that extended to protect the face. The Greeks, however, were soon to prove that they were the better equipped. Despite the disparity in the size of the forces, the Greeks felt the pressure to take the initiative. If word of the situation got back to the city it was possible that the Athenian Assembly would submit rather than fight. Worse, those Athenians who supported the drive for an oligarchy could strike a deal with the Persians, sounding the death knell of the democratic movement. And on the battlefield at Marathon, it too was a close thing. According to Herodotus, in the face of the apparently overwhelming force, of the 10 generals five were prepared to fight while five voted in favour of retreat. After an impassioned plea by one, Miltiades, in favour of joining battle, the casting vote was left to Callimachus, the War Archon. He voted with Miltiades: it was his vote that changed the course of history. As it happened, Miltiades had fought under Darius at Scythia, so he was familiar with Persian tactics. He knew that the Persians preferred long-range attacks, filling the air with arrows upon an advancing enemy and launching cavalry to make flanking attacks upon the reeling foe. He also knew his force was better armoured and better armed. The opposing forces formed into battle lines on September 11. Facing the Persians, Miltiades had had to weaken his line to match the breadth of the Persian line; otherwise the Persians could outflank him. As a consequence, the Greeks were unable to adopt the traditional Greek phalanx. The hoplites customarily went into battle in close ranks eight deep. Incongruously, Miltiades thinned his centre further, perhaps to half its normal depth, facing a Persian centre force at least 10 ranks deep. Miltiades weighted the ends of his line, anticipating an attack on his flanks by cavalry. It is also where peltasts (light infantry) were stationed, guarding the hoplites’ flanks, and harassing the enemy with slings and spears. It was a bold gamble; a break at the centre could have spelt doom, yet it almost seemed as if Miltiades anticipated that if his central force crumpled it would be an opportunity for his flanks to fold in and encircle the Persians: surprise and initiative would supplant strength. On the field, the forces stood 1500 metres (one mile) apart: their lines of battle each 1500 metres long. The Greeks attacked. Normally Greek hoplites would advance at a fast walk set to rhythmic music timing their advance: this may have been the way this attack began. However, upon closing to 400 metres (450 yards) and in range of Persian arrows the hoplites broke into a run. Without the support of either cavalry or archers it was an act that the Persians saw as foolhardy. However, the Greek general knew that Athenian strength showed itself in close-quarter combat—and it was where the Persians were most vulnerable. The hoplites carried into battle a hoplon—a 75-centimetre- (30 inch) diameter wood or leather shield covered in a thin sheet of bronze—a short iron sword and, most importantly, a 2.4 metre (8 ft) spear tipped with a four-bladed spike of bronze or iron. The Greek shield was virtually impervious to arrows, as was their breastplate, and their longer spears could engage the enemy before the Persians could respond. The Persian infantry, in addition to their light shields and armour, possessed only a dagger, a light curved sword, and a short spear. In the battle, the Greeks were forcing upon them, their weaponry and armour were out-matched. The heavier swords of the Greeks, in the hands of the disciplined, tightly packed phalanx, were hard to resist and shredded the Persian wicker shields. It was nevertheless a hard task. With the Persian force 400 metres away, the Greek soldiers were laden with armour and weaponry weighing upward of 50 kg (110 lb) and the necessity of wearing their heavy helmets was so onerous, they donned them only at the last. Even though the Greeks struck with the benefit of swiftness and surprise, their weakened centre faltered. But then the strength of their flanks, which had overwhelmed the forces that directly faced them, folded in on the enemy centre in a classic pincer. Now it was the Persians’ turn to waver and they withdrew in disorder. The Greeks pursued them to the water’s edge, seizing seven of the anchored triremes. Reports tell of almost 6400 Persian troops falling in the course of the battle, while the Greeks suffered less than 200 dead. Although Herodotus may have massaged both numbers for propaganda purposes, it was by any measure a surprising and spectacular victory. No-one has satisfactorily explained the absence of any mention of the Persian cavalry during the battle. Perhaps, despite its appearance, the terrain proved unsuitable, with knots of trees or bushland preventing a sweeping charge. Or perhaps the ground was too soggy for mounted troops, as we do know the last of the battle was fought on the marshy coastal fringe. Or the Persians may have strategically limited their force in order to tempt the Athenians into attacking before their Spartan allies arrived. The fact that the Persians were able to retreat with the Greeks at their heels for the loss of only seven triremes indicates perhaps that there may even have been problems with the cavalry’s transportation and they were not yet at the scene. But the threat wasn’t over. The Persian fleet still carried almost three quarters of their original force and it was now headed toward Athens itself. There was no time to rest on their laurels: the Athenian forces headed back to Athens, 35 km (21 miles) distant, to man its fortifications. And here the Persians blundered: instead of sailing straight to Athens, they stopped at Aegilia to pick up their Eretrian prisoners. The pause enabled the Greek force from Marathon time to reach the city. The Greek forces’ return to Athens was a feat in itself, commemorated today by the race we call the “marathon,” although it probably owes its origin to the apocryphal story of a run by Pheidippides’ to warn Athens after the Persian defeat at Marathon. Over time it has become confused with his run to summon the Spartan force to Marathon. For their part, the Pataeans had proved themselves noble allies. But more importantly, the Athenians had defeated the Persian forces without the aid of the militaristic Spartan city-state. Athens was beginning its ascendancy. The Persian fleet arrived off Athens’ harbour and belatedly realized they were too late; Athens was already strongly defended. In the end, all they could do was return to Asia, bloodied and bowed. Intriguingly, Hippias the traitor didn’t make it back to Sardis; he died on the journey home, at Lemnos, from unspecified causes. Perhaps he feared the wrath of the king he had disappointed and ended his own life; or perhaps a disgruntled Persian soldier had taken it upon himself to act upon his frustrations and his sense of loss. Darius was enraged by this defeat, not only because it represented a new strategic threat to the west of his kingdom, but because of the humiliation handed out to his great empire—and thus to his prestige. The edges of his Empire which brushed against Europe were proving vulnerable. And there was still the matter of the Athenians’ betrayal, their lack of honour, and their disregard of the protocols that had served the Empire well. Darius almost immediately decided upon another punitive strike, working toward its eventuality over the next three years. It was a measure of his outrage that he planned to lead the venture himself, replacing Datis, his general. But Darius was 60 years old; his health was failing. Then, as it happened, a revolt in Egypt derailed his plans and he had to redirect his attention from Athens. He died shortly thereafter, his dream of subjugating the Greeks unrequited. And if the events that precipitated the strike against Athens reveal anything, they show that despite the military failure that overshadowed the latter years of Darius, he was nevertheless a man of honour. In the end, perhaps he deserves greater recognition for not only his governance and accomplishments, but also for the man he proved himself to be.